for the texture challenge (with a twist of glimmer/shine). then jumped at it with both feet!!! I will definitely be doing this again as it makes a gorgeous background. 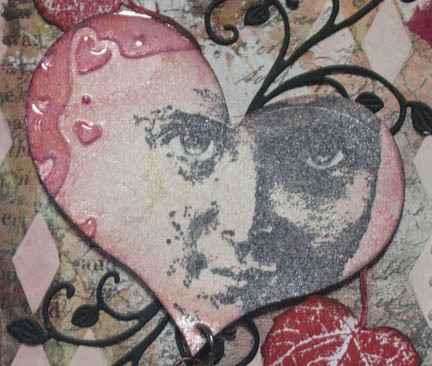 embossing and grunge paste make up the rest of the texture. so I haven’t added a lot. 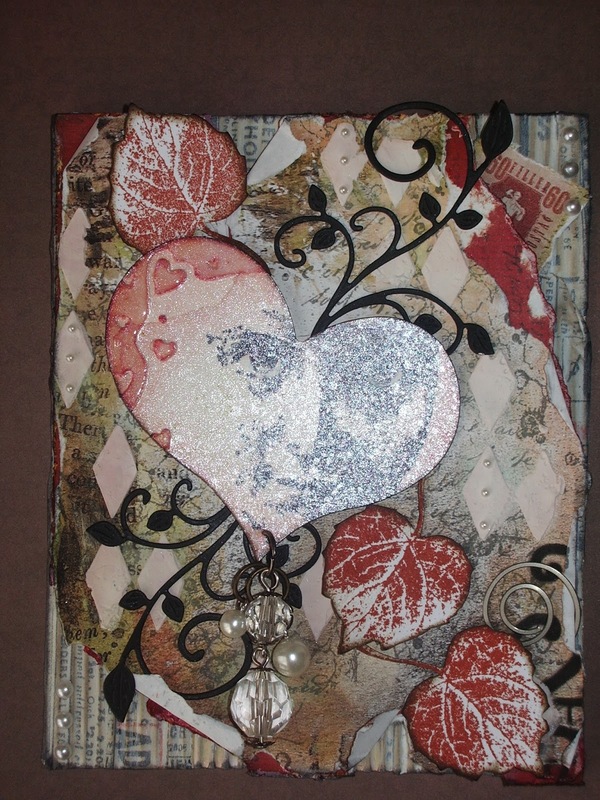 The glimmer is on the heart, the beads, metal and rhinestones. and pearl glimmer mist sprayed over the top. I just thought I would add this pic to show the glimmer on the heart piece. the team have some awesome inspiration to share! and I thank the team for the opportunity to do something different. As always stunning work Dot, thank you for sharing. I love this piece Dot, such a unique and creative card. Thank you so much for being a guest designer at crafts too, it has been a pleasure having you. Have a great week. Congrats Dot on being picked for a GD spot and my oh my how sultry does that image look on the heart. Loads of texture and inkiness everything looks so delicious. Love it. 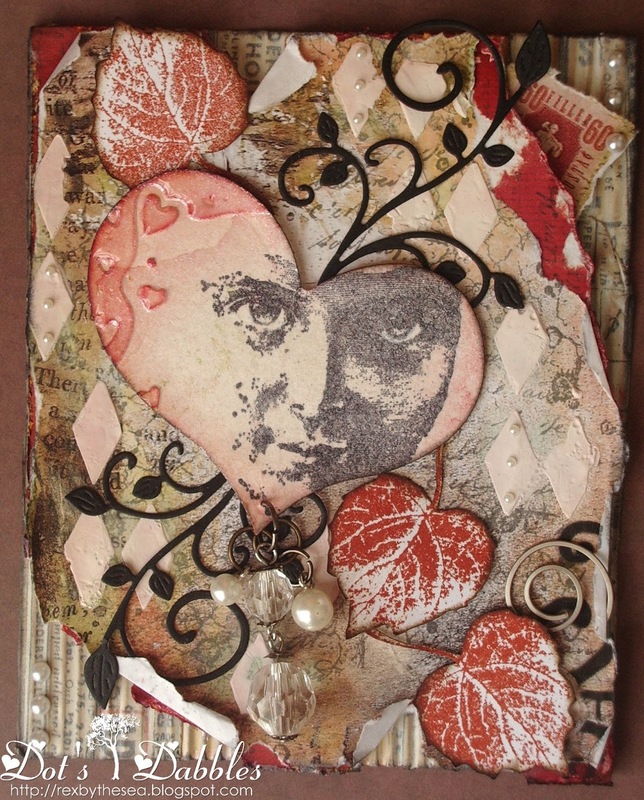 Gorgeous card, the image looks fantastic framed on the heart. First of all congrats on being a guest designer! This looks totally stunning, shabby and beautiful all at the same time! Congrats on your GD gig – it is well deserved! Your card is amazing! Thanks for playing along with the Drunken Stampers this week! That's a gorgeous card, fantastic details. Wonderful card Dot, I love the different textures and colours. Beautiful! Great colours and details. And a little shine never goes amiss. :)So glad you joined us at Drunken Stampers this week! So you really had to think about it that long? All kidding aside, big congratulations on a GDT spot so deserved! This project is a really eye catching! Love that heart and all the texture! Hugs!